Private Parking, Private Pool, Solarium, Terraces, Garden. Villa Madonna di Costantinopoli is a splendid and luminous three-story historical villa located on a hill, facing the sea, for eight people. The Villa is about 500 square meters, and has a private pool, wooden sauna, spacious private terraces with sea view, a private garden, air conditioning, heating, ice machine, Internet WI-FI, mobile phone charging station, parking private, wood-burning oven, outdoor shower. Villa Madonna di Costantinopoli exudes charm and gives amazement, it is a luxurious historical residence completely overlooking the sea and the amazing wonders that are the background to the small village of Praiano heart of the Amalfi Coast. 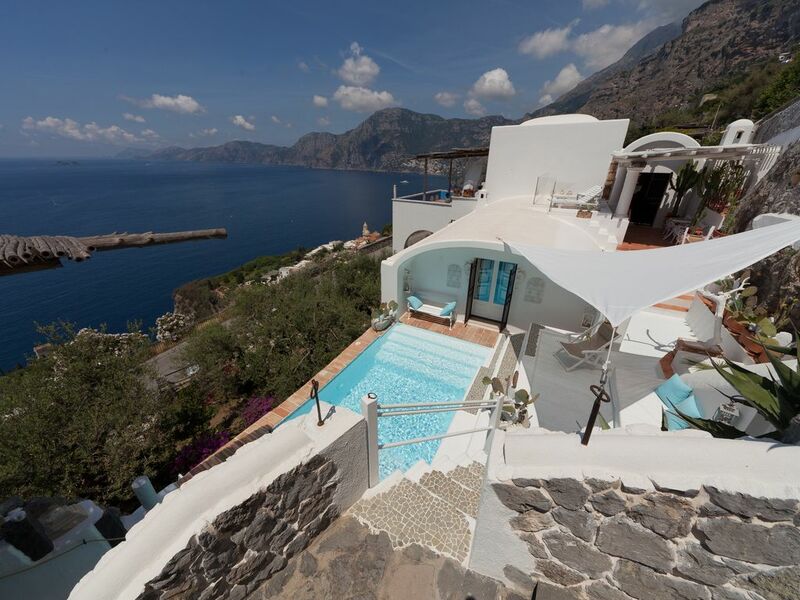 Located between lemons, olive trees surrounded by the Mediterranean, the Villa has a spectacular view suspended between sky and sea and overlooks a wonderful country, Praiano, in front of one of the most beautiful views in the world: the island of Capri, the Faraglioni, the Penisola Sorrentina, Positano, and the Li Galli Archipelago (formerly Nureiev property as well as Isola delle Sirene in the Odyssey of Ulysses). This prestigious villa preserves a fascinating history that dates back many centuries and some traces are still found today in authentic architectural and decorative details kept inside the villa. Praiano is a beautiful small town on the coast of Amalfi that boasts the privilege of being located in a unique corner for the incomparable views of the coast and the sea, from the Villa you can witness some of the most beautiful sunsets in the world. The door that gives access to the magnificent property consisting of about 500 square meters surrounded by terraces and gardens, lets immediately perceive the vibrant sensation of being completely out to sea. The house is all in white lime, wrought iron wood and stone, restored on ancient walls of fascinating Arab architecture nothing is left to chance. The rooms and rooms are all finely furnished with period furniture. From the enchanting private pool set in the sea rock, you can enjoy the magnificent sunsets of Praiano. The Villa has a cellar with over 100 labels of the best Italian and French wines with the possibility of buying and tasting. PRIVATE COOK, SCHOOL KITCHEN, MASSAGE, PRIVATE DRIVER, PIZZA SCHOOL WITH WOODEN OVEN, HOME DELIVERY, PRIVATE WINE CELLAR WITH WINES, AIRPORT TRANSFER, VIP SERVICES, AMERICAN BREAKFAST, PERSONAL ASSISTANT. We found the small town of Praiano to be perfectly situated between Positano and Sorrento to the north and Amalfi and Revello to the south. The villa is an expansive complex of gardens, patios, a pool area and a large outdoor kitchen, dining and lounging area. The hardest part was deciding at which point of the day to gather at which spot to enjoy the incredible views of Positano, Praiano and on to Capri. The interior of the home is equally as beautiful with beautiful furnishings, art everywhere and a stylish design. Every windows is dressed with flowers and plants, you will be amazed at the collection of Italian pottery, ceramics, tiling and other items. Not unlike a walk through a art museum. The four bedrooms provide privacy with three of them offering immediate access to large outdoor patios with phenomenal views. (Three suitable for couples, 1 additional single bed in bedroom three and a small single with bathroom in the 4th interior bedroom. The main house kitchen is very well appointed with a separate pantry/prep area and dishwasher/sink/refrigerator. It is a excellent space to make large family dinners which we did most nights. There is again a separate area for laundry. The house and gardens is fully integrated into the hillside near the top of the town. The walk to local markets, restaurants and the beach will require walking but then again all the most beautiful sites in the Amalfi Coast require walking, managing steps and a general level of fitness. Great opportunities to burn off extra calories and enjoy the local culture. GianLuigi was a perfect host. He made himself available start to finish and helped us book a restaurant, arrange a day long boat trip to Capri, help us arrange car service for airport transfer, local buses and most importantly a beautiful family evening with a local chef making dinner in the authentic pizza oven in the outdoor kitchen. Hiring Chef Batha was a big highlight and a must do ! - water pressure in house for showers and bathing was excellent. - GianLuigi provided regular clean towel service and mid week cleaning in price. - the house has an outstanding wine selection in the family room bar and also a private wine cellar in the basement if you care to buy a special bottle, he has an outstanding collection of Italian wines. - the house has a full spa style massage room and you can hire a local masseuse. We loved out stay ! You will find the nearest restaurant 300 meters away, grocery 400 meters away, with free home delivery service. Bus stop a few meters from the villa. "La Gavitella" beach at 800 meters, including 300 stairs. The private parking at the main entrance is available for 2 cars. Price included: Private Parking for 2 cars, Air conditioned, Electricity, Gas, Weekly cleaning (Wednesday), Final cleaning, Four times a week Pool cleaning, Daily towels change, Beds linen, Pool towels, Welcome bathing suit set, Sauna Finland, Welcome Prosecco and fruit, Fresh flowers, Wi-fi connection, Daily Concierge service. Private Chef service available on request. (on payment) Municipal Tourist tax 3,00 € per night per person. Security deposit cash at arrival: € 1000,00 The security deposit will be returned to you prior to your departure less any charges for accidental damages to the property.